Last month, Sendgrid announced the public launch of SendGrid Marketing Campaigns—a new extension of their marketing email feature set. SendGrid is well known for its transactional message delivery and email relay service, that reportedly sends 20 billion emails per month. Now they make a step that brings it into the realm of full-fledged email marketing. Cassie Thill Stewart, product marketer at Sendgrid, gives an introduction. 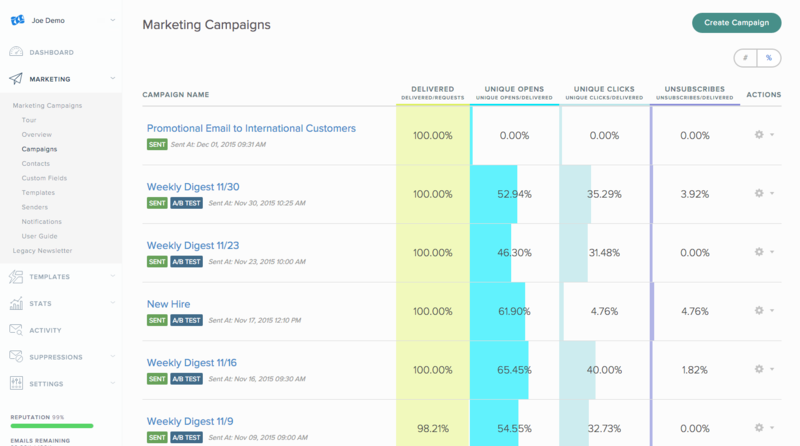 The emails created are sent via SendGrid’s own cloud-based email delivery engine (of course). Seeing that transactional messages are often triggered via API, the Marketing Campaigns features are also available via API. So marketing and transactional email can both be handled through it. As SendGrid itself says: Marketing Campaigns was built for developers and designed for marketers.